To promote and diffuse throughout the world, bonsai a living art that can be appreciated by all peoples. To exchange knowledge, technology, information, and related matters to the art of bonsai among countries of the world, thus advancing international friendship and goodwill. To sponsor and promote World Bonsai Convention (WBC) once every four years. Since the late 1970's Saburo Kato, Haruo Kaneshiro, John Naka, and Ted Tsukiyama worked tirelessly to create the World Bonsai Friendship for the pure love of bonsai. The catalyst for the creation of WBFF was “Expo '70” held in 1970 in Osaka, Japan. During this World's Fair, the efforts and unity of the Japanese bonsai community, including Saburo Kato's noble precept of "World Peace through Bonsai," was formulated. During the 4th World Bonsai Convention in Munich in 2001, the North American Region was again selected to host a World Bonsai Convention, this time for the 5th World Bonsai Convention to be held in Washington, D.C. in 2005. 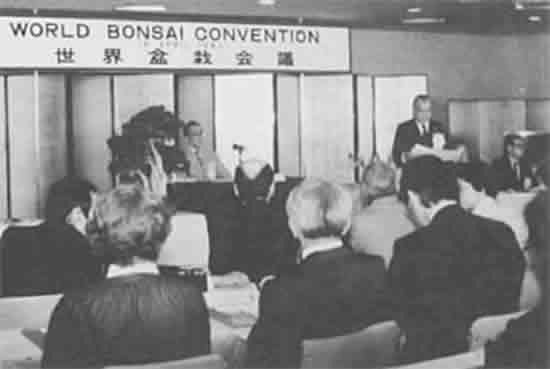 In addition, the WBFF Bylaws were amended in 2001 to pass the Chairmanship of WBFF to the President of the regional organization selected to host the next World Bonsai Convention, so from that time forward the WBFF Chairmanship has rotated every four years. Felix Laughlin became the WBFF Chairman from 2001 to 2005 with Saburo Kato becoming Honorary Chairman of WBFF and Daizo Iwasaki appointed WBFF Vice-Chairman. Hu Yun Hua succeeded Solita Rosade as the WBFF Chairman for the period 2009 to 2013. During the 7th World Bonsai Convention in Jin Tan, China in 2013 the Japanese Region was selected as regional host for 2017 and Jiro Fukuda became the organisations’ Chairman. Naemi Iwasaki was appointed as Vice-Chairman. During the 8th World Bonsai Convention in Saitama Japan during 2017, the Australia/New Zealand Region was selected as regional host for 2021. Lindsay Bebb became WBFF Chairman and Naemi Iwasaki continued in the role of Vice-Chairman.